In my book, there are not a lot of reasons to wake up at 5:00 am. But, a sunrise flight in a hot air balloon is one of them! 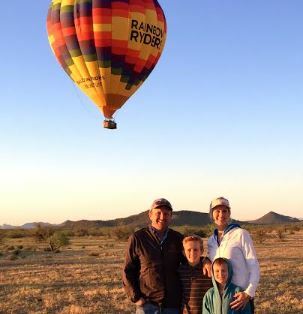 Rainbow Ryders, the largest hot air balloon company in the US, hosted me, my husband, and our 11 and 8 year old sons, for this ride of a lifetime over the Sonoran Desert. My boys helped hold the opening of the massive 275,000 cubic foot balloon as fans began to inflate our balloon. The propane burners finished the inflating, and our beautiful Arizona State flag globe rose into the morning sky just as the sun was coming up over the mountains. There were twelve of us in our basket anxious for Taylor Aldous, our pilot, to guide our balloon on a spectacular ride. The weather and wind were perfect which allowed him to safely navigate not only up 6000 feet high, but also, down close to the Saguaro and Barrel cacti, the Brittle Bush and the Palo verde tree…and to skim up and through a beautiful mountain pass. When we touched down after 90 minutes, it was impressive to see the employees ready and waiting to swiftly pack up the balloon and basket and return us to the office for a champagne toast, breakfast and to receive our first flight certificate! Being the biggest doesn’t necessarily mean you are also the best, but Rainbow Ryders truly lives up to its experience and reputation. With 23 balloons and three locations (Albuquerque, Phoenix, Queen Creek), it’s no wonder that 22,000 people enjoy this fabulous experience with them each year. And, that they are the exclusive and official balloon ride operator of the Albuquerque International Balloon Fiesta, a 600 balloons event. Thank you Rainbow Ryders for a beautiful and memorable morning!! !